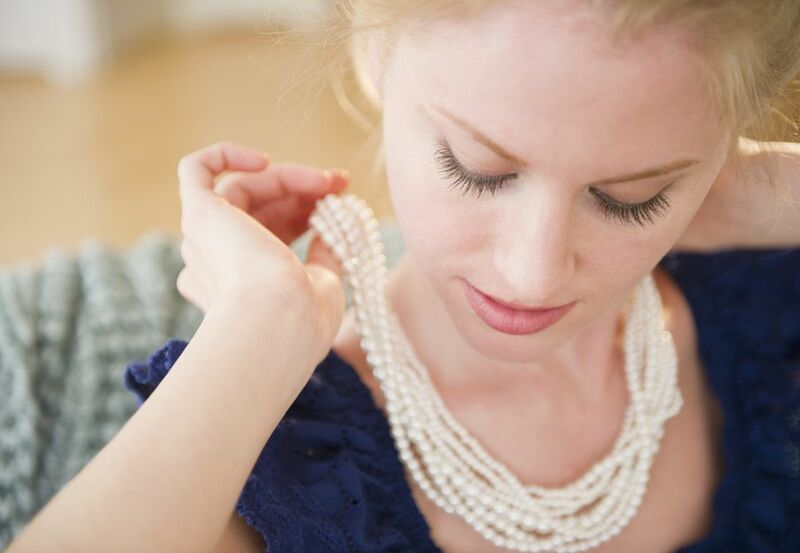 Pearls are elegant and classic, but they are also elusive and mysterious. Most people don't realize that the majority of pearls on the market are not natural. As a gem of the ocean, finding natural pearls is a much different process than mining gemstones, and the process of harvesting pearls has been exhausted over the years. With the supply of natural pearls deleted, the only choice then is farming mollusks and artificially injecting them with small particles. The following pearl information will provide educational resources to help demystify one of June's most sought after birthstones. Is a pearl a gem? Pearls are an organic gem. They are considered organic because they are created by living creatures. Each pearl begins its existence as a piece of grit or another small particle that makes its way into the shell of a marine or freshwater mollusk. The mollusk's defense mechanism kicks in and coats the particle with layer after layer of a substance called nacre, or mother-of-pearl, which eventually becomes thick enough to form a pearl. Unlike most non-organic gemstones, pearls are classified by their origins and their shapes. Natural Pearls: Natural pearls are formed when an accidental intruder enters a mollusk's shell and continuous layers of nacre grow like onion skins around the particle. Natural pearls vary in shape depending on the shape of the piece being coated. Natural pearls have always been considered rare and are quite expensive. They are usually sold by carat weight and are vintage in nature. Cultured Pearls: Like natural pearls, cultured pearls grow inside of a mollusk but due to human intervention. A shell is carefully opened and an object is inserted. Shapes of objects vary depending on the final shape of the pearl that's desired. Over time, the object becomes coated with layers of nacre. The depth of the nacre coating depends on the type of mollusk involved, the water it lives in, and how long the intruder is left in place before being harvested. As nacre thickness increases, so does the quality and durability of the cultured pearl. Cultured pearls are sold by their diameter size in millimeters. Saltwater Pearls: Saltwater pearls originate within a saltwater mollusk. Saltwater pearls can be either natural or cultured. Freshwater Pearls: Freshwater pearls grow inside of a freshwater mollusk — one that lives in a river or a lake. They are almost always cultured. Fake Pearls: Fake pearls are composed of coated glass or plastic. Plastic pearls are easy to decipher because they are lighter, show wear and chips easily, and are not as smooth as "real" pearls. Glass pearls can be harder to point out because they more closely resemble genuinely cultured or natural pearls. Spherical pearls are round, which is traditionally the most desirable shape. The rounder the pearl, the more expensive its price tag. Symmetrical pearls include pear-shaped pearls and other shapes that have symmetry from one side to another. These are not round. Baroque pearls are irregularly shaped pearls. They are often the least expensive category of pearls but are unique and quite beautiful. A lot of antique jewelry contains natural baroque pearls. This guide only skims the surface of pearl information. Check out our fun and amazing pearl facts to further your pearl knowledge. Despite their cultured nature, pearls are still one of the most popular gems on the market. They are considered a jewelry staple in the same way a black dress is considered a fashion staple.